Hyderabad, 6th July 2017: The knockout stages of the 34th Youth National Basketball Championship for Boys and Girls got underway at the Indoor Stadium, Gachibowli in Hyderabad. The Championship is being organized by the Hyderabad District Basketball Association under the aegis of the Telangana Basketball Association and the Basketball Federation of India. From the girls’ side, Kerala, Uttar Pradesh, Karnataka, while in the boys, Punjab and Haryana, are through to the semifinals. Kerala girls had no trouble against Maharashtra, with their superior size and steady execution on both ends of the floor. Kerala centre Ann Mary Zachariah showed her class, with the offense repeatedly running through her in the post. Displaying sound awareness, Zachariah would either back down her defender to score, or draw the foul and go to the freethrow line or else attract the double team and pass to the cutting Aparna Sadasivan who was able to make tough runners in the lane look easy. 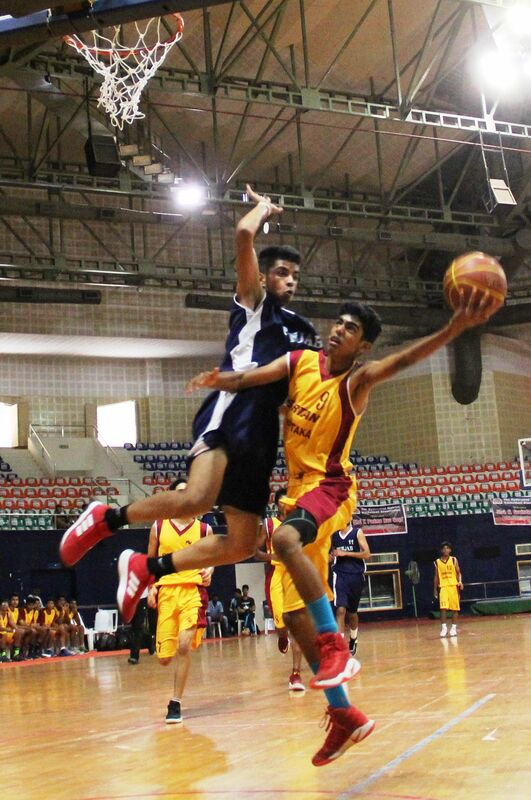 In the first boys’ semifinals, Punjab dominated the much shorter Karnataka team, winning 89-66. Punjab centre Princepal Singh, listed at 6ft 10.5 inches, controlled the paint and prevented any inside scoring opportunities for Karnataka. Karnataka point guard Prashant Tomar tried his best to drive and dish but the big bodies of Punjab proved to be a stumbling block for the southern side. Karnataka could only end up scoring from beyond the arc or in transition, which wasn’t nearly enough against this well oiled Punjab team that are now heavy favourites to go the distance. Compared to the first two quarterfinals, the next two proved to be extremely close fought affairs. A resurgent UP team, which seems to have improved across all age groups in recent years, outlasted Punjab girls 60-52 to book their spot in the final four. Punjab led at the end of the first quarter, before UP wrested the lead with a 15-9 second period. At halftime, the score read 24-20 in favour of UP and the second half saw this well coached side continue to gradually build its lead. With as many as four players scoring in double digits, it was a consummate team effort that saw UP prevail. Meanwhile for Punjab, Radha Rani top scored with 18 in the losing effort. The fourth quarterfinals between Tamil Nadu and Haryana was perhaps the most exciting one of the day so far. There was little to choose from between these two bruising teams even though Tamil Nadu led by double digits at the end of the first and third quarters. Haryana kept mounting comebacks and a massive three point play by Mukesh took the side up by 1, 71-70 with 22 seconds remaining. Tamil Nadu took a time out so as to start the offensive possession on the front court. But the inbounds play couldn’t have gone worse for TN as Haryana’s Sahil forced the turnover and scored in the ensuing possession, to close out the memorable 73-70 win. The young TN side should hold their heads high for a game well fought, but would perhaps rue the fact that they let a winnable game slip from their grasp. In the fifth quarterfinals Karnataka girls had it very easy against a Madhya Pradesh side that seemed to lack energy from having played a pre-quarterfinals game earlier this morning. Tamil Nadu girls too outclassed Chhattisgarh 73-49. In the last two quarterfinals, Andhra Pradesh and Madhya Pradesh shocked Kerala and Uttar Pradesh respectively. Three key facts make these victories truly spectacular: 1) Both AP and MP are Level 2 teams that have come up to Level 1; 2) Both AP and MP were playing their second match of the day and the fatigue factor was expected to work against them; and 3) Both their opponents Kerala (3-1) and Uttar Pradesh (4-0) had topped their respective Level 1 Groups in the league stages. Andhra Pradesh has been impressive with its brand of ‘total basketball’ where all 5 players on the floor seamlessly rebound, shoot, defend and drive. MP, on the other hand, has been playing hardnosed gritty basketball that may not win the applause of purists but is effective nonetheless. They continued with their contrasting styles tonight at the expense of Kerala and UP. It remains to be seen how far they can keep going, but it is safe to say that they will be viewed as underdogs no more. * Both teams have already been relegated. This match is played so as to decide their lower level groupings for next year.